Educator and composer Rychard Cooper will be presenting "Complexity and Beauty: The Art of Brian Eno," at the University Art Museum this Saturday night at 7 PM. He took some time to talk about his work as a composer and teacher. Now, Jules Muck aka Muckrock, is adding her LA-by-way-of-the-UK touch of glam surrealism to the backside of MADE by Millworks in DTLB. Her love of art stemmed from the rush many future street artists get while being young and free: illegal tagging as a kid running amuck in the streets of Manhattan during the 1990s. Tagging then shifted to more legitimate forms of art after being influenced by Lady Pink, the Ecuadorian street artist who shifted not only graffiti but the role women play in it. From there, Muckrock developed her distinct, thick-lined style, reminiscent of the very style of Lady Pink and other late 1970s/early 1980s graffiti and street artists. 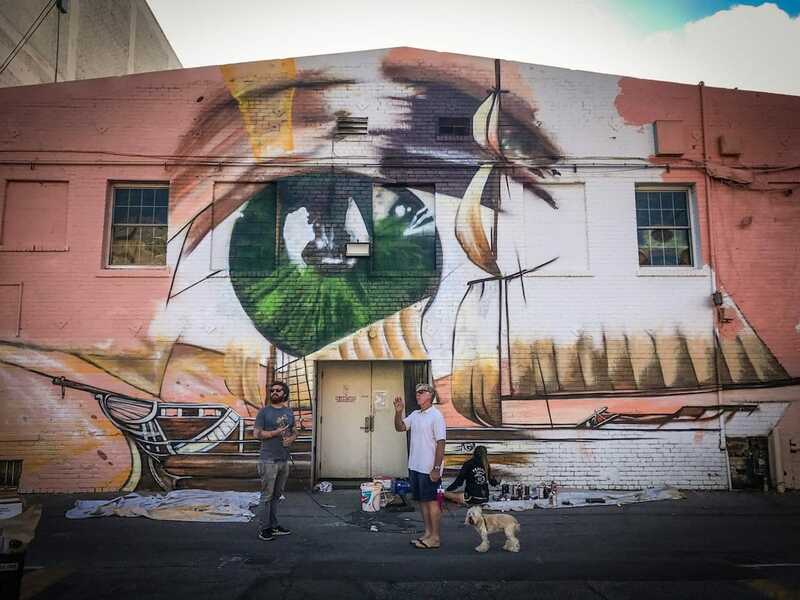 This piece in DTLB is somewhat of an exception, with details that are atypical of her work: a pirate ship with a giant eye piercing through its sails, the piece is a wonderful addition on what was otherwise a drab white wall. It joins the work of Telmo Miel just east of the MADE by Millworks building in the same parking lot on the south-facing wall of the Mark Schneider building. It is expected to be completed by the end of the day today. MADE by Millworks is located at 240 Pine Ave. The mural is accessible by either entering from the north on 3rd between Promenade and Pine or south on Broadway between Pine and Promenade.